While SAC still controlled most of the country's nuclear strength in 1960, substantial additional striking power was being provided by ballistic missile submarines and nuclear-armed missile and air units of tactical forces deployed in forward areas. The proliferation of nuclear strength brought with it the need for closer coordination of target planning among the services. Consequently, on 16 August, Secretary of Defense Thomas S. Gates, Jr., publicly announced the creation of the Joint Strategic Target Planning Staff (JTPS). Composed of representatives of all services, the JTPS was charged with the task of preparing and maintaining a National Strategic Target List and a Single Integrated Operational Plan (SIOP) to commit specific weapon systems to the various target to be attacked in the event of war. The Secretary of Defense directed the Commander in Chief of SAC to be the Director of JSPTS and that the staff be collacted with HQ SAC at Offutt. First B-58. On1 August, General Power accepted the first operational B-58 medium bomber from Air Research and Development Command in a ceremony at Carswell AFB, Texas. This aircraft was one of 12 turned over to the 43d BW, Carswell AFB, TX on that date. 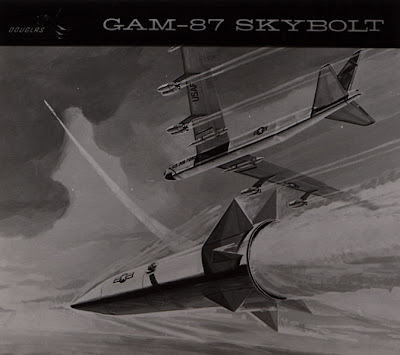 Built by the Convair Division of the General Dynamics Corp, the Hustler was America's first supersonic bomber, flying at more than twice the speed of sound. On 14 December, a B-52G of the 5th BW Travis AFB, completed a record-breaking flight of 10,078.84 miles without refueling in 19 hours and 44 minutes. On 27 February, the first Quail missle to be assigned to a SAC unit was delivered to the 4135th Wing, Eglin Air Force Base. In May, SAC reached it's goal of maintaining 1/3 of it's bombers and tankers on a 15-min ground alert. In a speech on 28 March, President Kennedy requested an increase in funds to strengthen and protect the strategic deterrent force. He called for 1/2 of SAC's B-52s and B-47s to be placed on 15-min ground alert. This posture was attained by both bombers and tankers by July 1961. B-58 record flight. On 12 January, a SAC B-58 of the 43d BW established 6 international speed and payload records on a single flight, thus breaking five previous records held by the Soviet Union. First B-52H. On 9 May, the first B-52H (SN 60-001) was delivered to the 379th BW, Wurtsmith AFB. Airborne command post began operations. Initiated on a trial basis in July 1960, the airborne command post (also called Looking Glass) began continuous operations on 3 Feb. These were converted KC-135 tankers equipped with the latest radio and communications gear. Additionally, SA's airborne alert was publically announced on 18 January 1961. Approximately 24 bases would support a number of B-52's in the air at all times, fully cocked and loaded. This was based on the successful completion of Operation Head Start, carried out at Loring AFB in 1958. Cuban Missile Crisis: The Russian buildup of offensive missiles in Cuba began influencing SAC operations several days before President Kennedy revealed the exact nature of the threat to the American people. A SAC U-2 overflew Cuba on 14 Oct, obtaining the first photo's of Soviet IRBM's being installed there. On 28 October, the Soviet Union agreed to remove offensive missiles from Cuba, subject to verification from the United Nations. SAC aircraft maintained close aerial surveillance while the missiles were removed. On 20 November SAC began shifting back to normal operations. 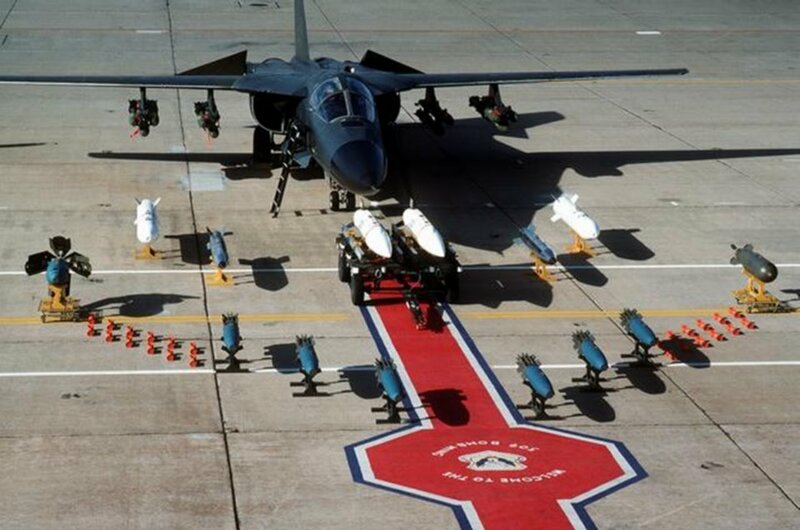 Deliver of last B-58. 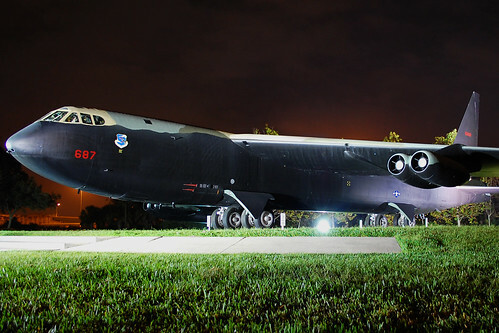 On 26 Oct, SAC received it's last 3 B-58's, assigned to Bunker Hill AFB, IN. B-47 Phase out. In line with Sec of Def McNamara's objective to dispose of all B-47's and KC-97's by the end of FY 1966, 4 medium bomb wings and 5 medium air refueling squadrons disposed of their aircraft in 1964. In support of this, "Reflex" operations stopped from stateside to Fairford and Greenham Common, UK, and Zaragoza, Spain. In 1964, with the B-47 gradually committed to storage at Davis-Monthan, AZ, there was still no firm plan for a replacement bomber to the B-52, which had it's last delivery in 1962. KC-135 and B-52 operations in Vietnam War. In January, the 5252d Strategic Wing was activated at Kadena AB, Okinawa. The 4252d began refueling fighter aircraft, and later in the year, B-52 bombers. The first B-52 Arc-Light bombing mission took place on 18 Jun3. On this mission, 27 B-52F bombers of the 7th and 320th BW based at Guam were used to attack a VC jungle redoubt with 750 and 1000 lb bombs. Big Belly modification. In December a "Big Belly" modification program was started to increase the B-52D's internal capacity to carry 500-pound bombs from 27 to 84 or it's capacity to carry 750-pounders from 27 to 42. The maximum bomb load would be about 30 tons. During the last 6 months of 1965, SAC KC-135 tankers flew over 40000 sorties in direct support of PACAF operations. B-52 phase-out begun. In 1965 SAC began retiring B-52F's that had reached the end of their service life; that is, they had reached a specific number of flying hours under certain conditions of structural stress. FB-111 selected for SAC. On 10 December, the Sec of Def announced that 210 FB-111's would be purchased at a cost of $1.7 billion as replacement for the older B-52's and B-58's. The new bomber was a modified version of the F-111 fighter which was originally designated TFX. Vietnam. By late June, after one year of participating in the war, the B-52's were dropping approximately8000 tons of bombs each month. In 1966, over 5000 B-52 sorties released bombs over target. Throughout 1966, B-52's continued to operate from Anderson Air Force Base, Guam. With the deployment of the B-52D (modified with the Big Belly to carry more conventional bombs) to Guam in April, the B-52F was replaced as the SAC bomber in the Vietnam conflict. Retirement of last B-47. On 11 February, the last two B-47 bombers (53-2286 and 53-6235) were transferred to the storage facility at Davis-Monthan, AZ. First SR-71. On 7 January, SAC receive the first SR-71, a "B" model trainer (SN 61-7957) assigned to the 4200th Strategic Wing at Beale AFB, California. Capable of flying 3X the speed of sound at altitudes exceeding 80,000 feet, the SR-71 could carry a variety of photographic, radar and infrared sensors. In 1967, B-52's flew approximately 9700 effective bombing sorties in Vietnam, almost twice the number of 1966. 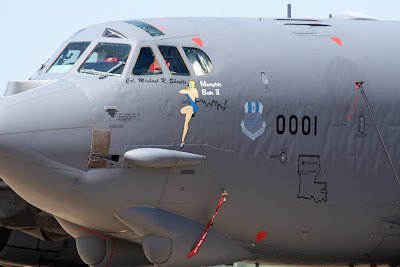 On 06 May, SAC flew it's 10,000th B-52 sortie in SE Asia. Up to that time, more than 190,000 tons of bombs had been dropped in less than two years of operations. Big Belly modification completed. Throughout the year, only B-52D bombers outfitted with the "Big Belly" modification were used in SEA. In July, SAC lost 3 B-52D's as the results of accidents in SEA. On 7 July, two B-52s collided in the air and crashed in the South China Sea. Among the casualties was Major General William J. Crumm, Commander of 3rd AD. KC-135 Operations in SEA. During 1967, SAC KC-135's flew over 22,000 sorties while dispensing over 1.1 million pounds of fuel in support of B-52's and fighters in the Pacific Air Forces. SR-71 and the sonic boom. In July, SAC began making supersonic SR-71 training flights over the United States, after warning residents of the corridors over which these flights were scheduled to expect sonic booms. Last RB-47. On 29 December, SAC's last B-47-type aircraft was flown to the storage facility at Davis-Monthan AFB. This was an RB-47H reconnaissance aircraft (SN 53-4296). Maintaining a deterrent force. While the war in SEA was demanding more and more B-52 and KC-135 support, the primary mission of SAC remained one of deterring a nuclear attack upon the United States. Toward this objective, SAC continued to maintain about 40 percent of the bomber force and nearly 100 percent of the ICBM force on alert. A small number of bombers continued to fly daily alert indoctrination missions. FB-111 Group Organized. Eff 2 July, the 340th BG, Medium, was organized at Carswell AFB, Texas. Assigned to the 19th AD of 2nd AF, the 340th was scheduled to be the first SAC unit to receive FB-111 aircraft. Khe Sanh. The defense of Khe Sanh developed into the largest and most significant air campaign to date. Around the clock strikes were made against enemy forces besieging the base, with SAC bombers accounting for approximately 60,000 tons of bombs dropped. With fighter-bomber support being limited by the monsoon season, which was at its height on 21 January when the base was surrounded, the B-52 was invaluable. Although the siege of Khe Sanh ended in early April, the B-52 bombing operations continued at a high level throughout the year, with a variety of targets hit in South Vietnam. B-52 crash at Thule. On 22 January, a B-52G with 4 nuclear weapons aboard crashed and burned on the ice of North Star Bay while attempting an emergency landing at nearby Thule AB, Greenland. In cooperation with the government of Denmark, the USAF conducted an extensive cleanup operation to remove all possible traces of radioactive material. SEA Operations. SAC B-52 conventional bombing operations in SEA continued at a steady pace during the year. In early January, U Tapao Airfield in Thailand was converted from a forward operating base to a main operating base for B-52's on duty in SEA. Satellite basing. On 20 February, SAC began testing a new satellite basing program at Homestead AFB, Florida, a TAC installation. In the test, B-52s and KC-135s of the 72d Bomb Wing, Ramey AFB, Puerto Rico, were relocated to Homestead and placed on ground alert. The test was successfully completed on 20 May. The program was designed to help counter an increasing sea-launched ballistic missile threat. Satellite basing was a continuation of the dispersal program of the late 50's and early 60s. FB-111 program reduced. On 19 March, Sec of Defense Laird announced that the FB-111 program would be reduced to 4 operational squadrons of about 60 aircraft plus some replacement aircraft. He also stated that the plane did not meet the qualifications for a true intercontinental bomber, but that purchase of 4 squadrons was necessary to "salvage what we can of work in progress." Advanced Manned Strategic Aircraft (AMSA). On 19 March, at the same time the FB-111 program was reduced, Secretary Lair announced that additional funds were being added to the defense budget to develop an entirely new, long-range manned bomber, the Advanced Manned Strategic Aircraft. On 3 November, the AF requested proposal be submitted for full-scale engineering develpment of the AMSA, or B-1 as it came to be called.